My girls two favorite Chinese take-out dishes are orange chicken and sesame chicken. 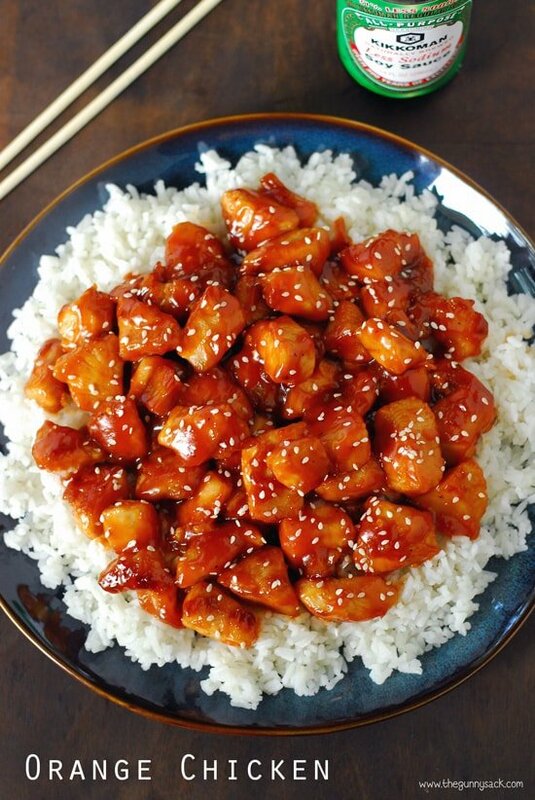 After my Honey Sesame Chicken was such a huge success with my family, I decided to try making Orange Chicken. My plan was to make the orange chicken in my Crockpot like I did the sesame chicken, but I made a 30-minute skillet recipe instead. 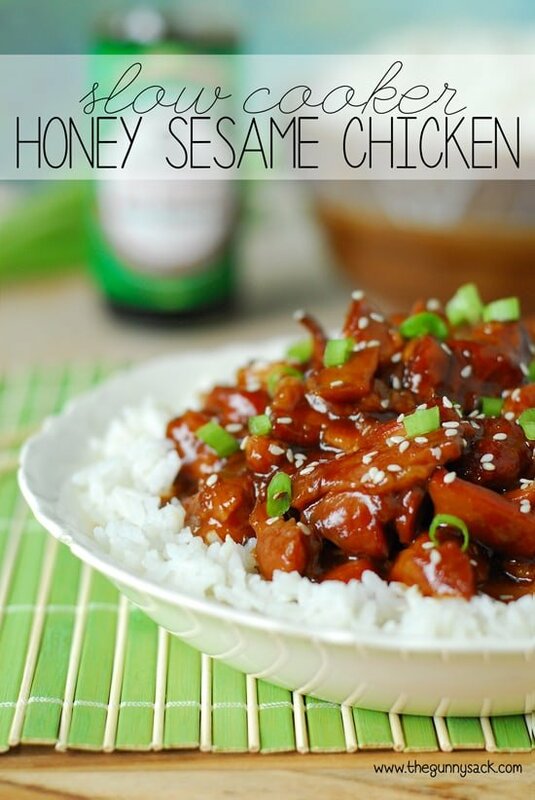 UPDATE: This recipe was originally shared in August of 2014 and has been very popular. But after many of my readers expressed their disappointment in this recipe, I decided to update it in July 2016 to make it milder with less orange flavor as they requested. For those of you who loved the original version, you can still print it here. For the rest of you, I hope this updated version is more in line with what you were looking for. Start by cutting 1 1/2 pounds of chicken breasts into chunks (about 1 – 1 1/2 cubes). Mix together soy sauce, cornstarch, and water. Add the chicken and stir to coat. Allow the chicken to marinate for 5 minutes. 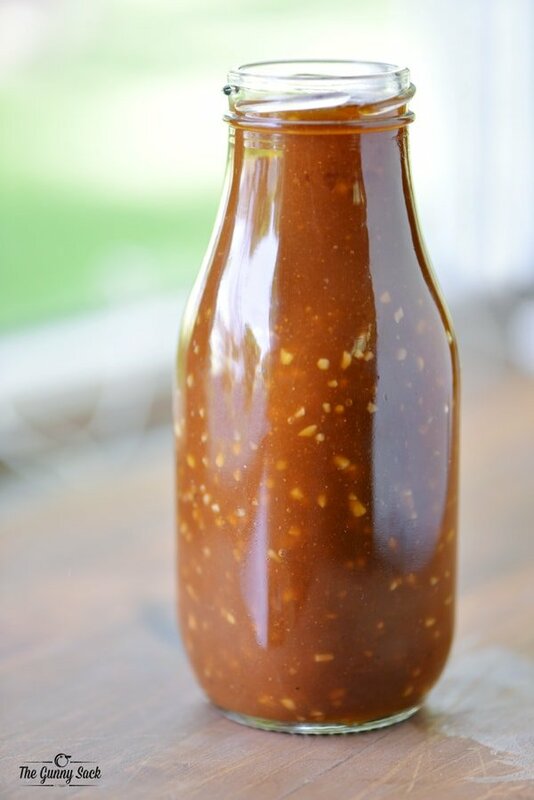 While it is marinating, prepare the orange sauce so that it is ready when you need it later. 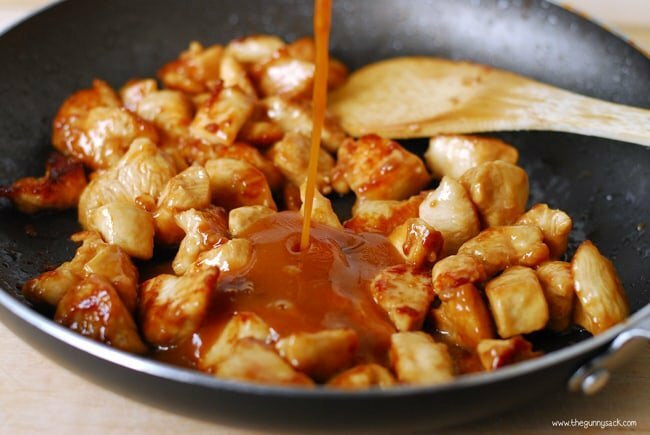 Whisk together orange juice, dark brown sugar, cornstarch, soy sauce, hoisin sauce, rice vinegar, orange zest, and optional sriracha sauce. 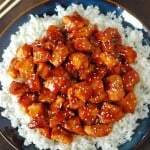 I made this orange chicken a little healthier by opting not to deep fry the chicken pieces. Instead, the chicken in sauteed in two tablespoons of oil. Heat 2 tablespoons of vegetable oil in a large skillet. 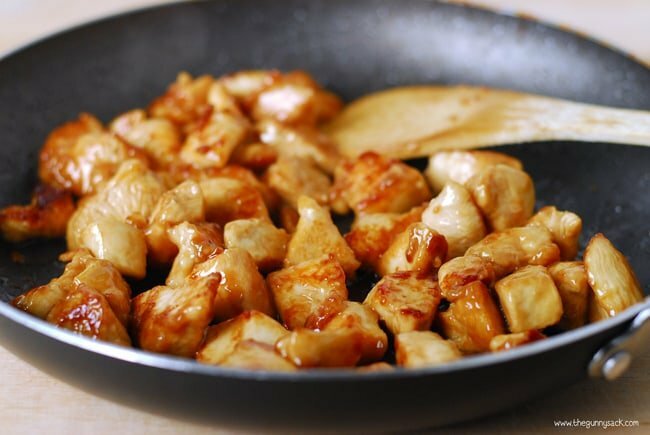 Remove the chicken from the marinade with a slotted spoon and carefully add it to the skillet. Stir-fry the chicken, over medium-high heat, for 5-7 minutes until golden and cooked through. Add the orange sauce to the chicken and cook for 4-6 minutes, stirring occasionally, until the sauce has thickened. Your kitchen should be smelling pretty amazing by now and your family will be coming into the kitchen asking what you are making! 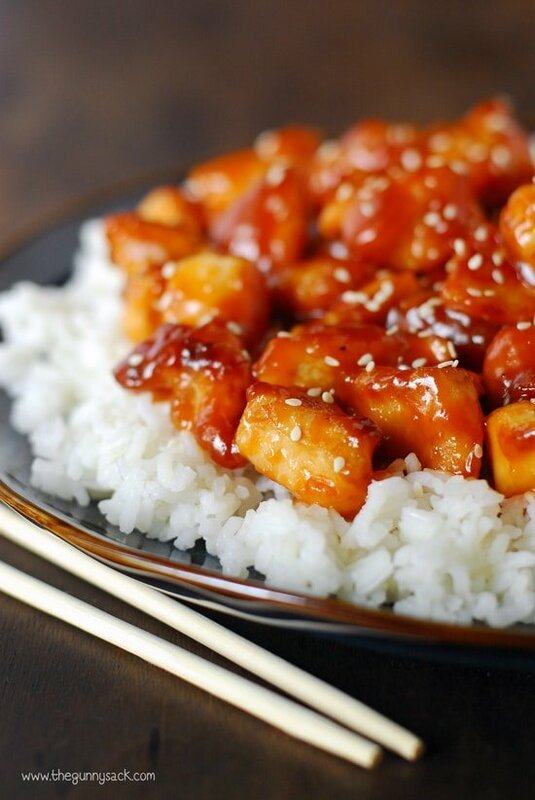 Sprinkle with sesame seeds and sliced green onions, if desired and serve the orange chicken over rice or noodles. We really enjoyed this orange chicken and ate the leftovers the next day. Vanessa said that she has never tasted orange chicken that actually tastes like oranges and that she really liked it! I love that the entire meal can be made in less than 30 minutes. 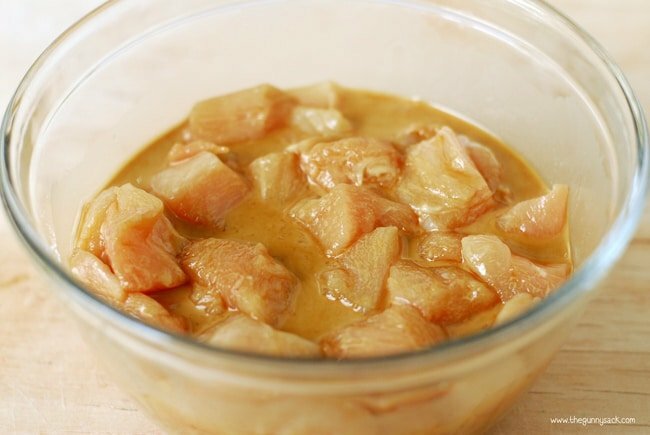 Start by cutting 1 1/2 pounds of chicken breasts into chunks (about 1 – 1 1/2 cubes). Mix together soy sauce, cornstarch, and water. Add the chicken and stir to coat. Allow the chicken to marinate for 5 minutes. 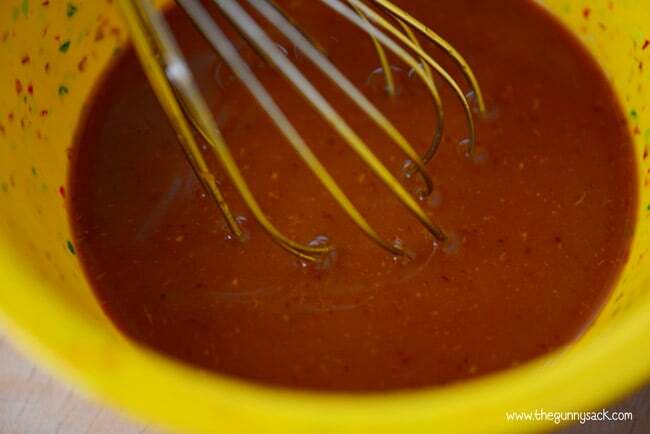 While it is marinating, prepare the orange sauce so that it is ready when you need it later. Whisk together fresh squeezed orange juice, dark brown sugar, cornstarch, soy sauce, hoisin sauce, rice vinegar, orange zest, and optional sriracha sauce. Set aside. Add the orange sauce to the chicken and cook for 4-6 minutes, stirring often until the sauce has thickened. Top with sesame seeds and sliced green onions, if desired. Serve over rice or noodles. Recipe updated from original in August 2014. The family really enjoyed this chicken dish. I didn’t have hoisin sauce, so I substituted raw honey from the fridge. I was also generous with the ingredients… used a little more than 3/4 cup of fresh juice and an extra tbsp of brown sugar. I also chopped and browned (caramelized) an onion and sprinkled it over the top when I served the platter. Love, love ,love this recipe.. making it again tonight for the 3rd time. Doubling it to haves for lunch tomorrow.. I tried it yesterday and my family and I loved it. I had to put a little bit of food coloring to the sauce to make it orange instead of brown (my soy sauce is very dark) and it turned out great. I realized later I forgot to add the hoisin sauce, but it tasted good like that, so if you don’t have it in your fridge, that works too! 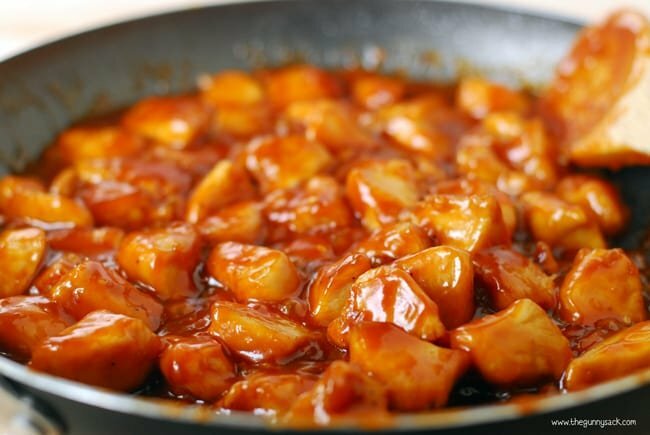 I am not familiar with the cashew chicken, but if you are talking about the color of the sauce it could be the type of soy sauce used, there is dark soy sauce that then to dye foods on a darker tone and there is light soy sauce that doesn’t cause the effect. Being a single dad I like to be able to throw dinner together pretty quick. My 13 year old daughter has been eating Chinese food since she can walk and Orange Chicken is her favorite. She didn’t care for it. I made broccoli with it and it was the first time she ate all her broccoli. I didn’t care for it either. Too much of BBQ sauce taste. I look forward to trying the improved recipe. If you’ve ever eaten decent Chinese food on a regular basis you probably won’t like this. I was rather disappointed by the recipe. We did make it a night ahead so my hubby could have it at his guys night. The sauce was not orange at all. May need to try the original recipe. This was wonderful! Made it for a family Sunday dinner and my brother is Vegan. I substituted firm tofu in his dish and it turned out great! Now even my picky daughter asks for this dish, thanks!! Really good whole family loved it. Very easy too. I changed the oj for pineapple juice and added chopped white onion, peppers and pineapple….added a bit more vinegar for more zing….very yummy! Thanks for the idea! I can’t wait to give it a try! I made the original recipe tonight with the concentrate and it was delicious! It was the perfect amount of sweetness and orange flavor. I am surprised by the amount of negative reviews. Glad I went ahead and made it despite the naysayers. Yum! Comience por cortar 1 ½ libras de pechugas de pollo en trozos (alrededor de 1 – 1 ½ cubos). Mezclar la salsa de soja, almidón de maíz, y agua. Añadir el pollo y revuelva para cubrir. Deje que el pollo macerar durante 5 minutos. A pesar de que se está marinando, preparar la salsa de naranja para que esté listo cuando lo necesite más tarde. Batir juntos el jugo de naranja recién exprimido, azúcar moreno, almidón de maíz, salsa de soja, salsa hoisin, vinagre de arroz, cáscara de naranja, y Sriracha opcional. Dejar de lado. Calentar 2 cucharadas de aceite en una sartén grande. Retire el pollo de la marinada con una espumadera y cuidadosamente agregarlo a la sartén. Sofreír el pollo, a fuego medio-alto, durante 5-7 minutos hasta que estén dorados y bien cocidos. Añadir la salsa de naranja para el pollo y cocine durante 4-6 minutos, revolviendo con frecuencia hasta que la salsa haya espesado. Arriba con semillas de sésamo y las cebollas verdes en rodajas, si se desea. Servir sobre arroz o fideos. I love love love this recipe! We made it a few times back in the spring and loved it! Silly me never saved the actual the recipe so I panicked when I saw you had changed it. Thank you for keeping the original recipe accessible. The only thing we do different is add a green pepper, just for a little something else! I just tried making it last night for a family dinner. IT WAS A HIT!!! It tastes better and much healthier than take out! The only think I did differently was use regular no pulp orange juice and did not use orange zest. The added siracha made it great too! I was a little hesitant mixing the orange sauce because it was sooo liquidy but after adding it to the chicken, my God, it was amazing!! Hi! I just made this tonight… Delish! Anyway, I noticed that you had another version- the original. I decided to take a look to compare. I just thought I would point out, on the Original version, it is listed on the recipe card as a “Dessert”. Whoops. LOL. Thanks again! I made this recipe for the first time back in May and my family loved it! I put it on the menu for tonight and came to look at the recipe this morning and saw that you had updated it. I’m not sure why anyone would want less orange flavor? I’ll be making the original recipe for our dinner, thanks for leaving the link to it so I could still find it. Really yummy. 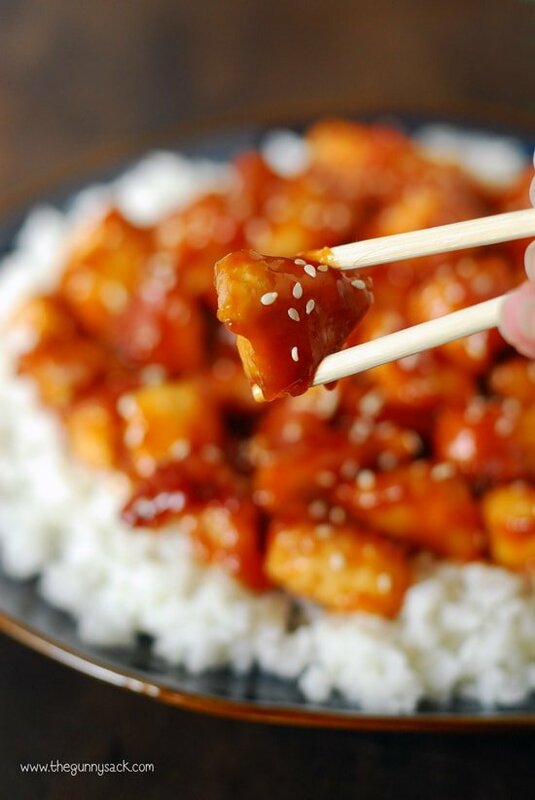 Only 1 thing: Orange chicken is supposed to be sweet. This was more savory. I rarely leave comments on recipes I’ve pinned and tried, but I had to hop online after finishing the dishes up tonight because, Holy COW, that was a GREAT dinner! 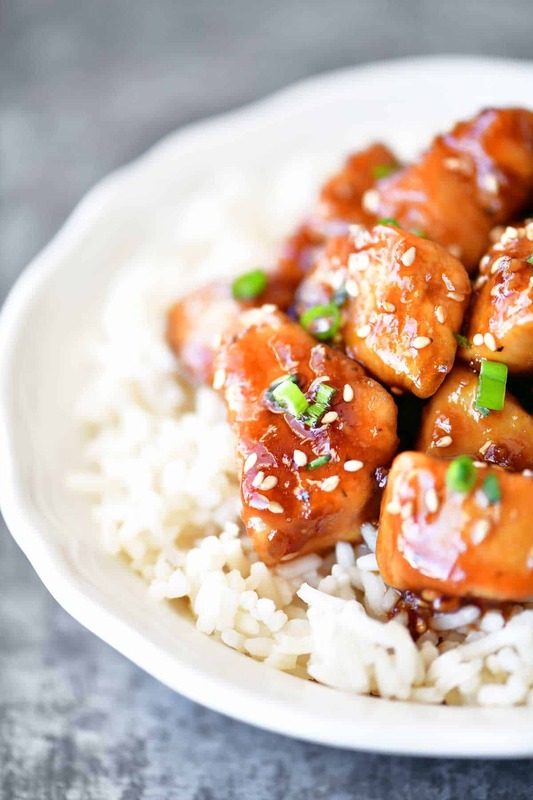 I made this revised version of your orange chicken and it really, really hit the spot–I was totally impressed with the flavors and how well it came together. The only thing I changed was that I used orange juice in place of fresh squeezed (and because I had no orange, no orange zest either). Other than that, I followed directions exactly as written and polished off two helpings worth of this dinner (side note: my 2-year-old and 4-year-old also gave me ZERO problems with this meal tonight, happily gobbling it up, and because most nights it’s a war just to get them to even TRY dinner, I consider this a major win!). Thanks a billion for this yummy meal–I’ll definitely be adding it to my dinner rotation!! I made this tonight and use fresher squeeze orange juice and added the chili sauce for spice! It was fantastic! I also added a little more soy sauce. We used thighs bc that’s what I had on hand. Did people not taste the sauce? You can cut the orange in have and just try it to your liking. Anyhow thanks for the recipe! Taste is individual and you need not have changed your original for a few blind cooks. 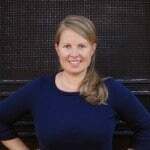 Thank you so much for your support, Heather! <3 That is why I kept the original recipe up too. It is what I will continue making for my family because we love the zesty flavor. Made this tonight and I’m sorry to say it was the worst “orange Chicken” I’ve ever made and I’ve made plenty. 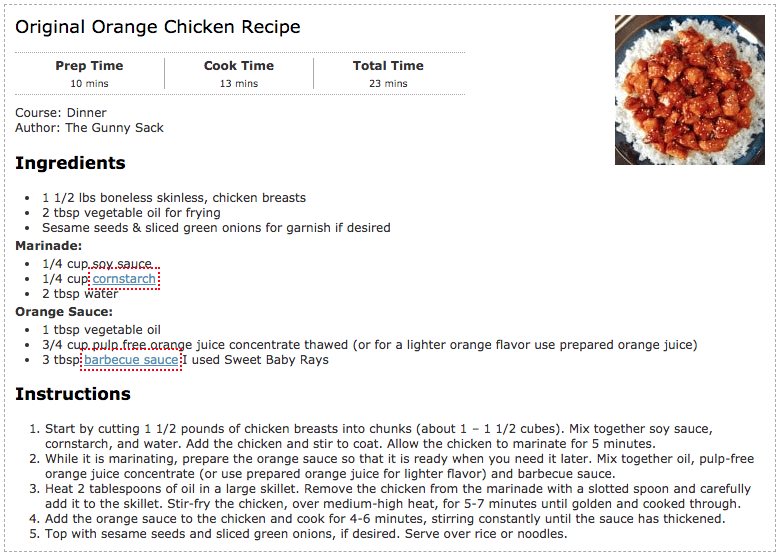 This recipe is not even close to the recipes I’ve followed for the other orange chickens. Thanks for sharing your feedback. I’ve updated the recipe to be milder with less orange flavor, although it still isn’t deep fried like other recipes you may have seen. I liked this recipe, but it was way too tangy! I might try it again, but use half the orange concentrate. Then again, I may never try it again, I wasted so much chicken on this round that I’m not sure I want to risk wasting more. We loved the tangy-ness of the chicken, but I’ve updated the recipe to be milder with less orange flavor. Thanks for your feedback.